Home / Soaps / Coronation Street Spoilers and Gossip 2017 / ​Coronation Street 23/09 - 29/09 - Is The Game Up For Will? Michelle is surprised when Leanne and Steve join forces to help her nail Will as her stalker. They hatch a plan to get him out of the house for a business meeting with Michelle, lifting his keys from his pocket she gives them to Steve who makes a copy and heads to the house with Leanne to find evidence whilst Michelle keeps Will busy at the Bistro. But have they bitten off more than they can chew and will they get the evidence and get out of the house before her returns? Things are looking bleak at Underworld after Eva failed to persuade Adam to cancel his plans to ruin Aidan. Is this the end of Underworld, and can Aidan and Johnny do anything to get the business back on track? As the workers start to hear rumours about what led to the close of the factory accusations fly and Aidan is public enemy number one. Audrey offers Bethany an apprenticeship as a beautician at the salon, but with her confidence still low Bethany is unsure if she can do it. Bethany is shocked when Mel turns up on the street and tells her she can’t testify against Nathan as she fears for her life, explaining she was one of his first victims. Sarah arrives home and is shocked to see Mel. Bethany tells Sarah she needs to get Mel on their side as her word won’t be enough to see Nathan and co punished. They invite her to stay the night in the hope of trying to persuade her but is Mel being totally honest about her reasons for turning up out of the blue? Gary arrives home much to Sarah and Anna’s delight. But he is hiding some serious bruises along with secrets about what his job out there really entails. Anna spots the bruises and tackles him about the truth of his new job. Clearly struggling with his new secret life he goes on an all night bender and when Sarah tackles him about his behaviour he storms out. Nicola finds him in the ginnel and invites him to number 11 Over a bottle of wine, Gary opens up to Nicola about his time in the army while she shares tales of her own eventful youth. Reflecting on where they’ve ended up and how much they have in common, Gary and Nicola start kissing passionately. Will one thing lead to another or will Gary come to his senses before betraying Sarah? Andy concocts a scheme whereby Phelan will free him from the cellar but be guaranteed of his silence when Andy commits a crime of his own. Phelan’s shocked as Andy argues he then couldn’t grass up Phelan to the police without implicating himself. Elsewhere, Liz confides in Moira that she’s arranged another date with Lenny the scammer and this time she intends to nail him. Rana and Moira turn up to gawp as Liz meets Lenny in the Rovers but they’re stunned to discover his true identity. 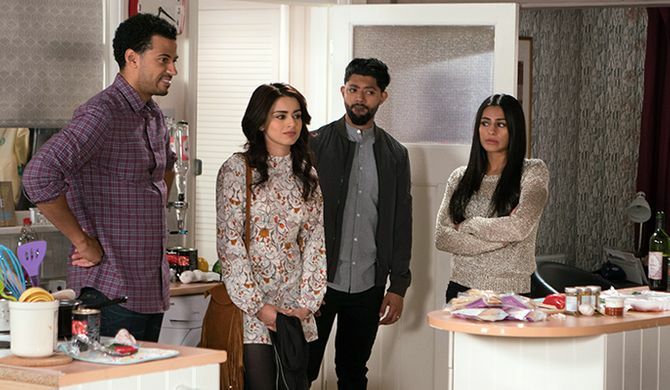 Alya tries to sort out the row between Rana and Kate but a night out backfires. Peter and Toyah’s attempts to build bridges with Steve lead to a mix-up with Liz.